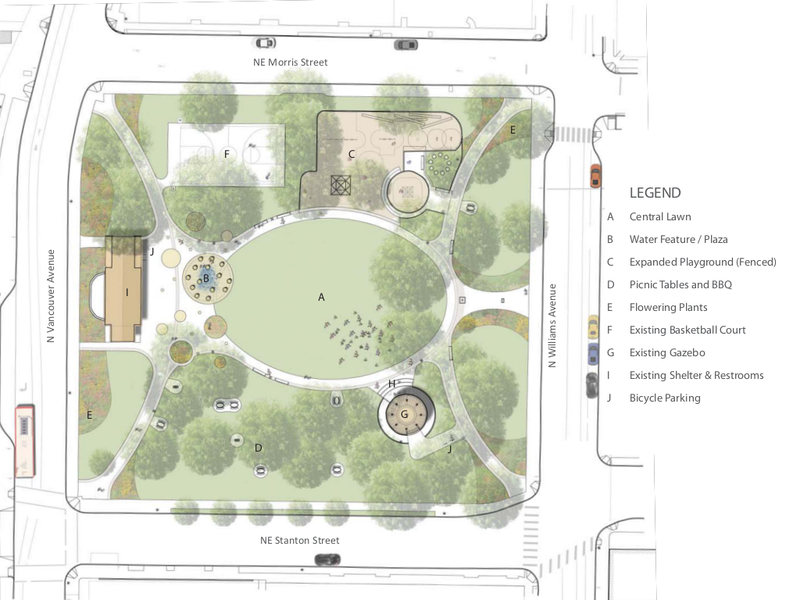 The children’s play area will be vastly enhanced and due to a $200,000 donation by Legacy Emanuel Medical Center, a water feature will be added to the park. ADA accessibility will be improved, bike parking will be added, and the park should be in tip-top shape after this $2.1 million renovation is complete in late spring/early summer 2014. I am quite excited for the prospects. More information at can be found at http://www.portlandoregon.gov/parks/54478. After long delay on a project that started in the fall of 2010, the Portland Bureau of Transportation will be working towards re-configuring the traffic lanes on North Williams Avenue in early 2014. A long list of improvements were proposed by a stakeholder advisory committee of 26 people, including new traffic lights on North Cook street at North Williams and at North Vancouver avenues. The city has gathered funds from a $1.3 million State of Oregon grant, and is also proposing a local improvement district (LID) to collect money from local businesses. In addition, the City will be installing a buffered bicycle lane on the left side of North Williams Avenue. The road will be narrowed from two lanes to one in two sections: from Broadway to Fargo Streets, and from Shaver to Killingsworth Streets. These changes in combination with some additional marked crosswalks should make crossing the street a breeze. Look for these changes to come in Spring 2014.